For DCI Malcolm Ford, the call out to a murder at Stirling’s, Cowane’s Hospital is no ordinary shout. The severed head of known petty criminal, Billy Griffin and his connections to hard-line paramilitary groups leads Ford down a narrow and dark road, with enemies in high places. 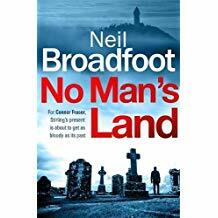 Introducing the reader to the main protagonist Connor Fraser, reveals a former Police Service of Northern Ireland (PSoNL) Detective who was forced to leave when he and his girlfriend were targeted by paramilitary gangs. A complex man, driven to find the truth regardless of the cost, Connor is drawn into the case when he realises that the second murder has a connection back to his days in the PSoNI. Now working in close protection, he’ll use his connections and work with Ford to find the killer (or killers). Meanwhile, disgraced newspaper reporter, Donna Blake, sees the murders as a chance at redemption and a path to the big time. What none of them know is the lengths the killer or killers will go to protect their hidden secrets, or how high-up the political spectrum their investigation will lead. The author gives us a ‘what at first glance’ appears to be a standard murder mystery, with a fair chunk of fast paced police procedural, filled with action. And for most books, that would be fine. But the author has brought his previous experience as a journalist to bear providing the reader a much richer mille feuille of a tale. He uses the city of Stirling as a backdrop, which becomes almost a character. He also allows us a look inside the machinations of a local newspaper, as well as a glimpse into Scottish politics and the links to sectarian gangs in Northern Ireland. It’s a heady mix, but one the author delivers with care and skill. This is the first Connor Fraser book, but I for one can’t wait for the second.